Definition and description of the Triangle: The Triangle can be described as a percussion instrument consisting of a metal bar bent in the shape of an open triangle. The triangle was introduced during the 14th century. Description: An instrument of percussion, usually made of a rod of steel, bent into the form of a triangle, open at one angle, and sounded by being struck with a small metallic rod. It is believed to have played some part in church services of the period. A sort of roll can be produced by striking each end of the triangle alternately in rapid succession. The tone of the triangle is clear and ringing, but has no definite pitch. Family of Instruments: The Triangle belongs to the family of Percussion instruments. 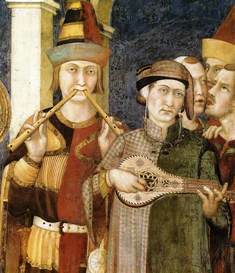 Medieval Musical instruments, including the Triangle, would be used by the musicians of the period including the Waits, Minstrels or Troubadours. There were three categories of musical instruments in the Middle Ages - wind, string and percussion. Terms of description were Bas instruments and Haut instruments. Bas referred to soft instruments (literally, "low," but referring to volume, not pitch) which were suitable for the chamber which included the vielle, rebec and other bowed strings, the lute and other plucked strings. Haut referred to loud instruments (literally "high" but referring to volume, not to pitch) which were suitable for outdoors which included the shawm, sackbut, pipe and tabor. Read the above history, facts and information about the Triangle. The Medieval Times website provides interesting facts, history and information about the musicians and styles of music which scatter the history books including Triangle. The Medieval Life and Times Sitemap provides full details of all of the information and facts about the fascinating subject of the lives of the people who lived during the historical period of the Middle Ages. The content of this article on Triangle provides free educational details, facts and information for reference and research for schools, colleges and homework for history courses and history coursework.